Yesterday we said goodbye to our beloved nanny… at least for a couple of months. She’s going back home to visit with her grandchildren. I didn’t want to give her a too-big gift, because she’s supposed to be coming back (and I certainly hope that she does – she still has our house keys,) but I did want to give her a memento to take with her. She’s watched me make several quilts over the last 10 months, and I knew she loved the blue minky. What to make her? Can’t be too big, as I’m doing it at the last minute (as usual.) Nothing too intricate or fancy. Something that screams our names… got it! It’s a mini-quilt. Or a potholder. Maybe a trivet. 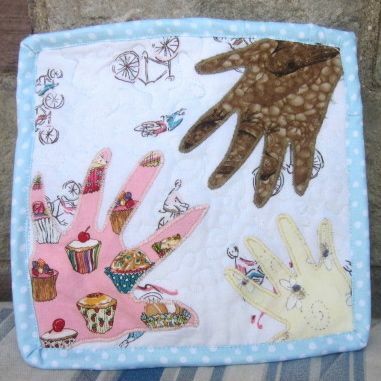 A quilted handkerchief. Something cuddly. It’s perfect. I told our nanny that whenever she misses us, she can hold the children’s hands. 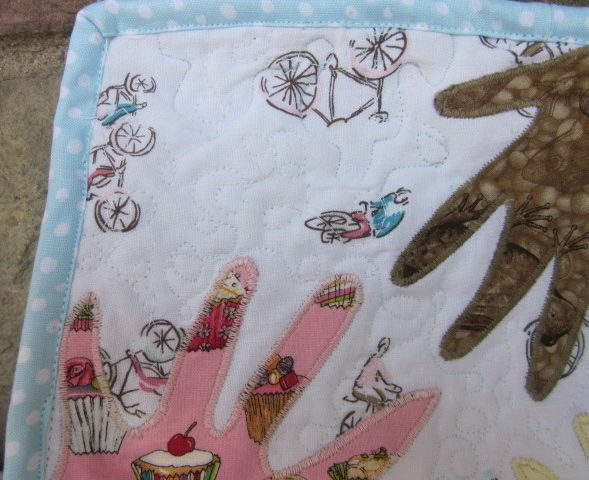 The hands are actual size – I outlined each child’s hand and then cut it out of a fabric that seemed appropriate: cupcakes for K, who’s always jonesing for sweets, frogs for N (his favourite hat is made with this fabric,) and bumblebees – busy flying around – for R. The bicycle background is an homage to our bakfiets. I experimented with free motion quilting again, and fell in love with simple loop-de-loops. So easy! 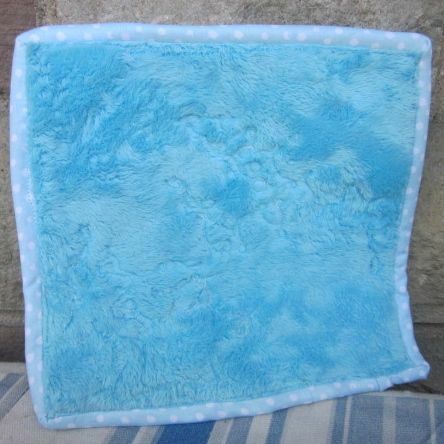 And, of course, the back is made of her favourite blue minky. She loved it. the first thing she did was put it up to her face and nuzzle it a bit, which sounds weird but is completely understandable to anyone who has touched minky. It just makes you want to cuddle up with it right away. And it was so quick and easy, I’m left wondering if my grandmother would like one. What do you think? Actually I just had a little lightbulb moment. Our shul has a custom – when we do kiddush, everyone is touching someone who’s touching someone etc who’s holding the challah. It’s somewhere between a human chain and a group hug (and clearly would not work so well in an Orthodox setting!) I’m so tempted to make a challah cover with my family’s hands so we can all be “holding the challah”.